A range of tongue studs and tongue bars made from steel and Titanium. 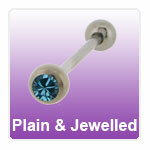 Available with plain ball, jewelled and flat disk ends in a range of Titanium colours and jewels. "Very straight forward with no delays"